ScreenSteps Desktop 2.9 and Workgroup DocumentationScreenSteps Desktop & WorkgroupScreenSteps 2.9 Working with ScreenSteps LiveHow do I Download a Manual from ScreenSteps Live to my ScreenSteps Desktop Library? 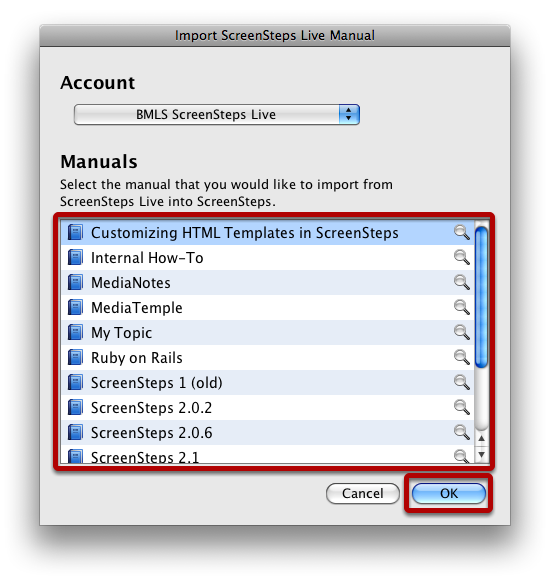 This lesson will show you how to download a manual from ScreenSteps Live, complete with all of its package files, to your ScreenSteps Desktop software. Once the manual is downloaded you will be able to edit the lessons and repost them. IMPORTANT: In order to download lessons in a manual, the packages must have been uploaded to ScreenSteps Live. Select the manual you wish to download and select OK. The manual will be downloaded and imported. 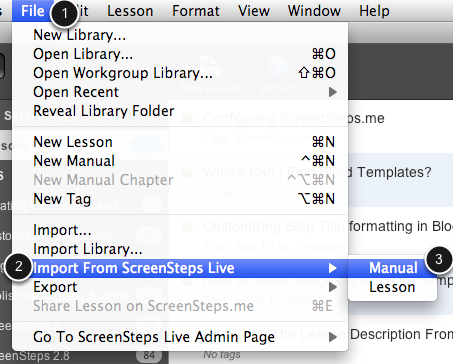 Next: How do I Update a Lesson on ScreenSteps Desktop From ScreenSteps Live? If one of my editors downloads a manual I uploaded, does their download also included the template of the PDF file I created on my pc and store the (new) template onto their pc too? @Karin - Currently PDF templates are not synced between users. You would have to manually send the PDF template to your editor to use. OK, thanks for letting me know - I'll now know what to do. I'm trying to download manuals from a space I cloned, but I can't tell which space the ScreenSteps Desktop is pulling from. I also can't tell how to change which space it pulls from. Can you point me in the right direction? When you download manuals you aren't downloading them from a specific space. They are all of the manuals that you have permission to view. If you have multiple manuals that have the same name then you can change that in the website admin interface.